The 2012 Poky Pedals provided many highlights. This is a good time to reflect on these before turning our thoughts to future Bike Fun. 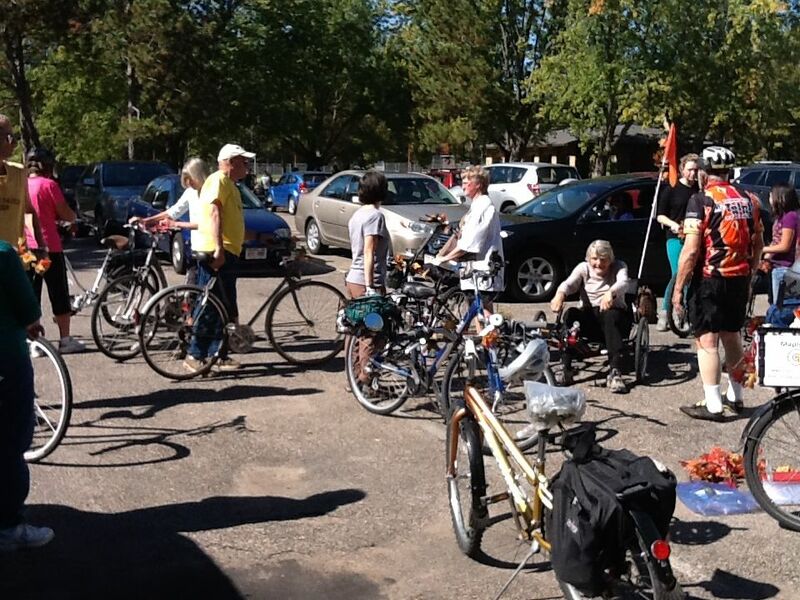 In this inaugural year for Poky Pedaling Stevens Point, we shared Bike Fun on 9 Poky Pedals. These rides averaged 12 Poky Pedalers, with a high of 25 on the September Maple Ride. Participants spanned from under 10 years old to over 80 years old. Over the course of these Poky Pedals, we explored many corners of the Stevens Point area. We rode in Stevens Point, Park Ridge, Whiting, and even hit a bit of Plover. We rode neighborhoods west of the Wisconsin River, north of Target and Fleet Farm, and south of the Patch St railroad tracks. We circumnavigated McDill Pond (or what would be McDill Pond if it hadn’t been drained), crossed both WI River bridges, and rode the underpass beneath I-39 connecting to the Portage County Business Park. Although some of this riding was on multi-use paths, the vast majority was on calm neighborhood streets showcasing our lovely urban scenery. 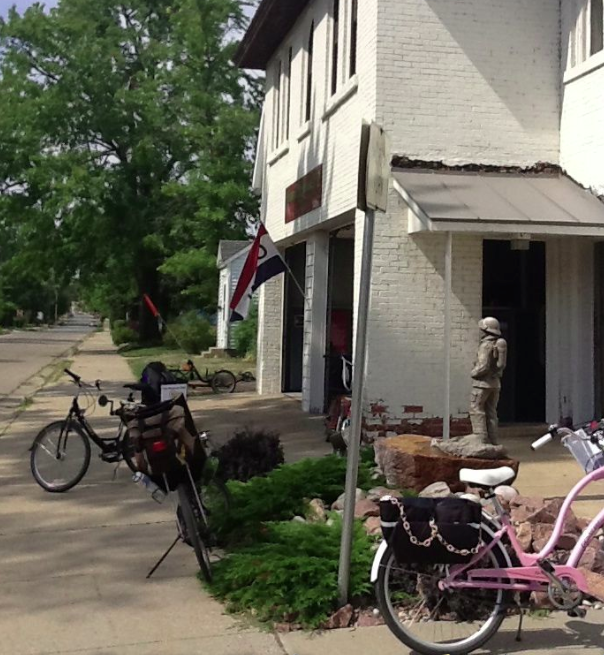 Poky Pedalers learned a fair amount of history about our area. One Poky Pedal was all about the story of Mosey/Moses Creek over the past 175 years or so. We were treated to pictures and stories of a bygone Stevens Point from members of the Portage County Historical Society when we visited Historic Fire Station No. 2 on Strongs St. We discovered who Slomann Park on the west side was named after, we visited the Civil War Monument across City Hall on Church St, we learned the history of the dam south of the Clark St bridge and the related efforts throughout the 20th century to reduce urban flooding upstream, and we stopped at Telephone Park whose name was inspired as a result of the WI Dept of Transportation deeding land to Stevens Point in compensation for a pay phone area demolished in a reconstruction project. Food played a major role in our Bike Fun. 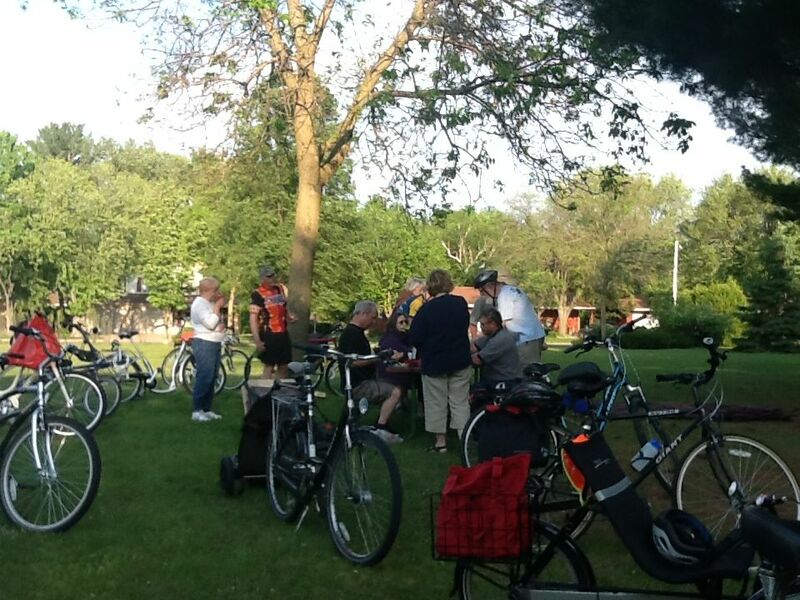 We enjoyed 4 Poky Pedaling Potluck Picnics together. These allowed us to discover calm routes to 3 food stores, including the recently-opened Copps near Park Ridge. The 4 mystery park locations provided a variety of picnic settings, from a riverside patch of grass off the Clark St bridge to a north-side neighborhood city park to a bluff overlooking McDill Pond. And no discussion of food and Bike Fun can be complete without mentioning the Epic Ice Cream Ride, the rolling ice cream tasting party that visited 5 different ice cream shops! But the most important part of Bike Fun is, well, having fun. And we certainly had our share. Although the summer was one big blur of Bike Fun, highlights include decorating our bicycles for the Maple Ride, admiring bike art at the Stevens Point Sculpture Park, singing the theme song to Sesame Street (in 15-part harmony), meeting Al the alligator, and discovering where Snow White and the 7 Dwarves hang out in Stevens Point. 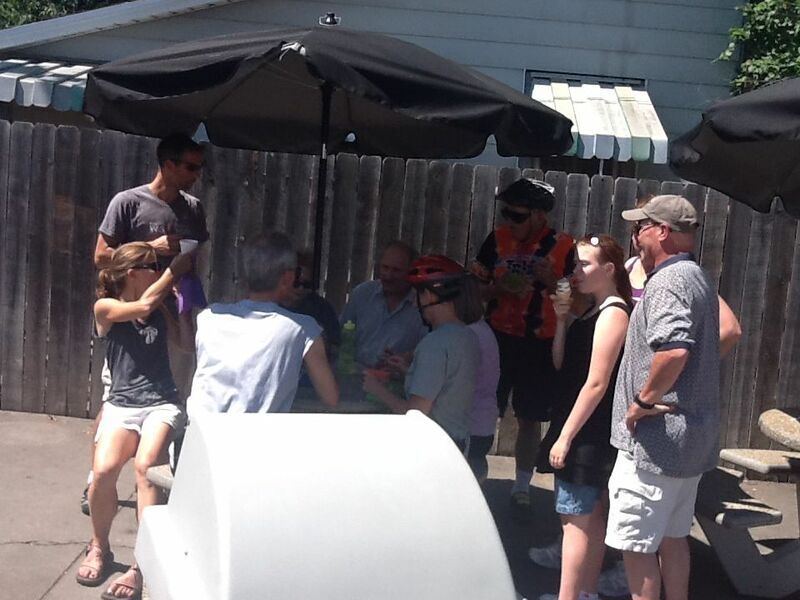 Of course, the most fun was conversation with friends, old and new, and riding our bicycles together. The 2012 Poky Pedal Schedule page now contains links to the Bike Fun Reports posted for each Poky Pedal. If you were there, you can relive all the Bike Fun. If you weren’t, you can see what you missed and motivate yourself to share Bike Fun on future Poky Pedals. Click here or look for it in the menu under the Poky Pedals tab. Speaking of future Poky Pedals, work on the 2013 Bike Fun Calendar is well underway. You can expect 9 more Poky Pedals that explore the scenery, history, and whimsy of the Stevens Point area. 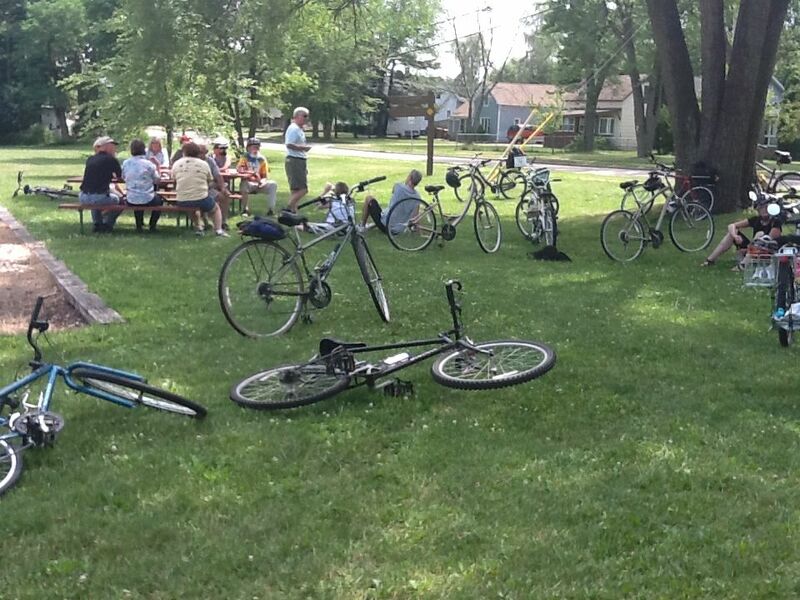 The monthly Poky Pedaling Potluck Picnics will occur May through August. There will be 4 new themed weekend rides, and the popular Maple Ride will follow a different route seeking out streets named “Maple” in late September. This review of all the Bike Fun we’ve shared makes me even more excited about next year’s Poky Pedals. In the meantime, checkout the PPSP website once in a while to read my blog and Twitter updates while waiting for the official announcement of the 2013 Bike Fun Calendar.